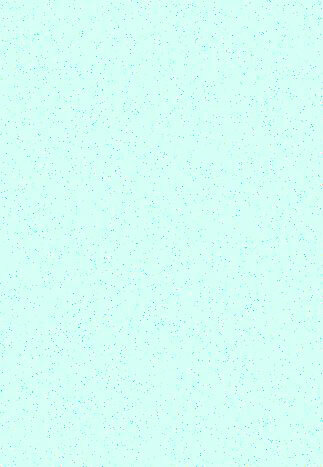 Bath salts are an excellent addition to any bath, as well as softening the water they provide valuable trace minerals which are readily absorbed through the skin. 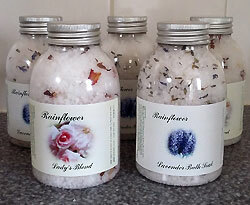 For more information on our bath salts, please click here..
Bath Salts in tin tie resealable bags: A blend of Sea Salt, Epsom salts, essential oils and dried flowers and leaves. Bath Salts in PET plastic jars: Lovely dumpy shaped jars with aluminium lid, both attractive and practical. 500gm of bath salts in re-sealable bag. 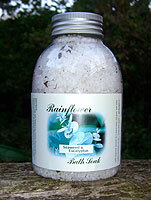 Can also be used as refill for bath salt jars. Ingredients..
500gm bath salts in PET plastic jar with aluminium lid. Comes with a muslin drawstring bag if you'd rather not have the petals and leaves in the bath water. 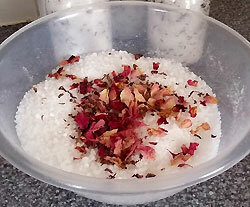 Lady's Blend With Dried Hibiscus, Marshmallow flowers, & Rose petals. Geranium, Lavender, Bergamot, Tangerine, & Rosewood Essential oils plus Rose fragrance Ingredients. Gentleman's Blend With Nettle, Lemon Balm, Witch Hazel and Rosemary leaves. Bay, Rosemary, Cedarwood, Rosewood, Juniper and Litsea Cubeba Essential oils. Ingredients. Green Tea and Mint With White tea, Green tea, Honeybush tea, Peppermint and Orange Essential oils. Ingredients. Heather With Heather fragrance oil and Pine essential oil and heather flowers. Ingredients.